After many fires of nest type ships or groups of ships and the fast spread of the flames to the adjoining ships, it was necessary to limit as much as possible the fire and its spread to the contiguous ships in such a fast way. The most delicate point is the wall that divides these two ships, called low wall, and within this element the most exposed part to the passage of the flames is the part of deck that connects both ships. In order to avoid this spread of fire, the “Fire Safety Regulation in Industrial Establishments” (RDSCIEI) of 2.004 in point 5.4. establishes the obligation to place a Strip of width equal to 1 m. having a Fire Resistance half than the low wall at a maximum distance of 0.4 m from the lower part of the deck. Weight: The Board weighs only 12.9 kg, so that a single operator can lift it, hold the panel against the structure with one hand and screw with the other. This is impossible with other types of plates much heavier. EI-60 solution with a single Tecbor Y 25 mm plate. The rest of the solutions come with two overlapping plates, which means that we have a faster execution time and a lower cost of material and labor. Finishing: the dovetail and groove leaves the system ready to paint without having to do any joint treatment. Economy: it is the most economic system that currently exists in the market. Format: ideal for horizontal strips 1 m wide and inclined 1.2 m, changing the layout of the plate without having to make any cuts. 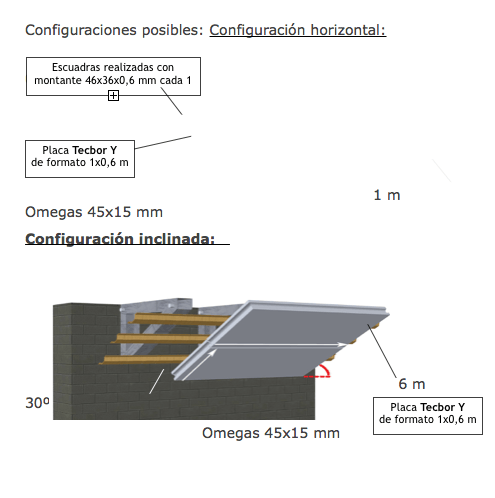 Simplicity of the installation: The installation of the system is also very simple and always, as usual in our systems, using support structure that can be found in any insulation warehouse, channel 46 mm and omegas 45 x 15 mm. 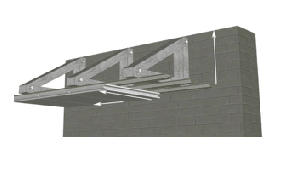 This system has been tested under the Test Protocol for Fire belt barrier systems – roof firebreak as it marks the current RDSCIEI.